First glimpse of Everest from Namche Bazaar! 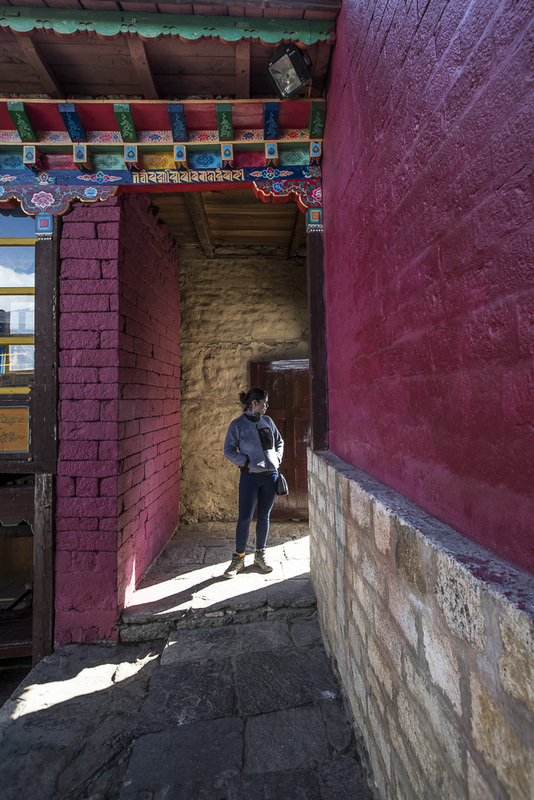 Namche Bazaar marks the last town before the serious trekking begins, whether you’re going to Everest Base Camp or doing the 3 Passes. It is the last town which stays functional for 365 days a year, the villages north of here shut down out of season. 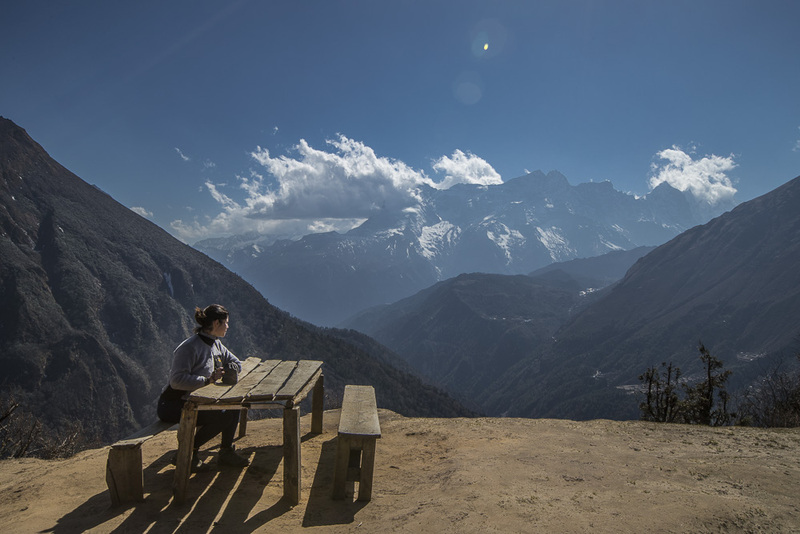 From Namche, you have an excellent view of the beautiful Ama Dhablam and on clear days, of Everest and her neighbours. We walked up to Everest view and sure enough, the promise was fulfilled although we had to wait for a stubbornly clingy cloud to let go of her peak and fly off. After a day’s acclimatisation it was time to set off for the real trek to EBC. Packs full of snacks and warm clothes we did the standard route from Namche to Tengboche, onwards to Dingboche then Lobouche and Gorak Shep. Every stop calculated to be within comfortable limits for altitude increase and for walking distance. 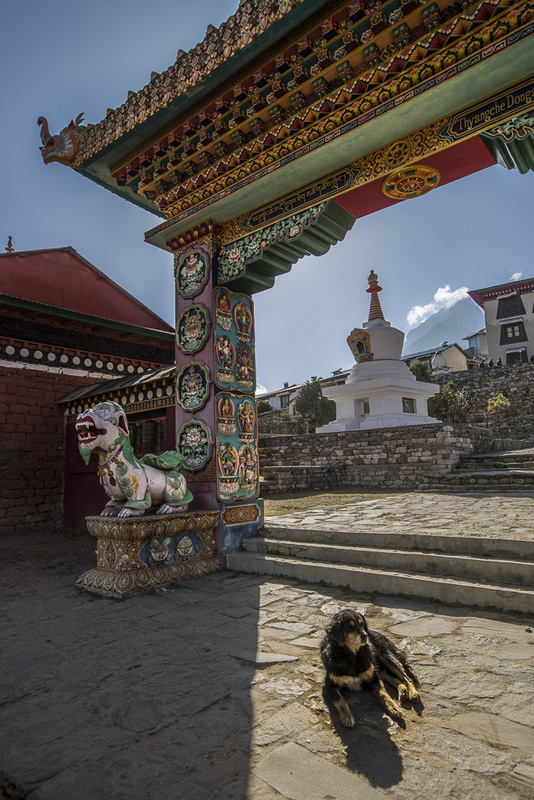 We left Namche on a sunny morning and sought a brief blessing from two of the stupas we passed on the way. Large organised groups of trekkers tried to dominate the narrow paths by singing loudly and generally ruining the peaceful but gruelling nature of the walk. They’d get in the way of porters trying to carry their loads and be generally irritating. We hurried up the pace to outrun them which was bliss as we then returned to the sounds of the high himalayas, the occasional birdsong against the rhythm of our boots on rock. 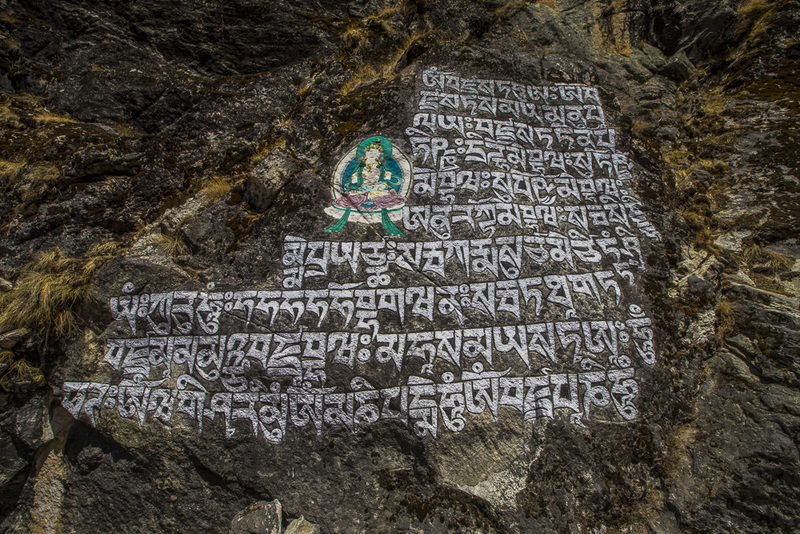 We passed many Mani stones and blessings on the way which was encouraging. The landscape is filled with good wishes and it permeates into your mood. 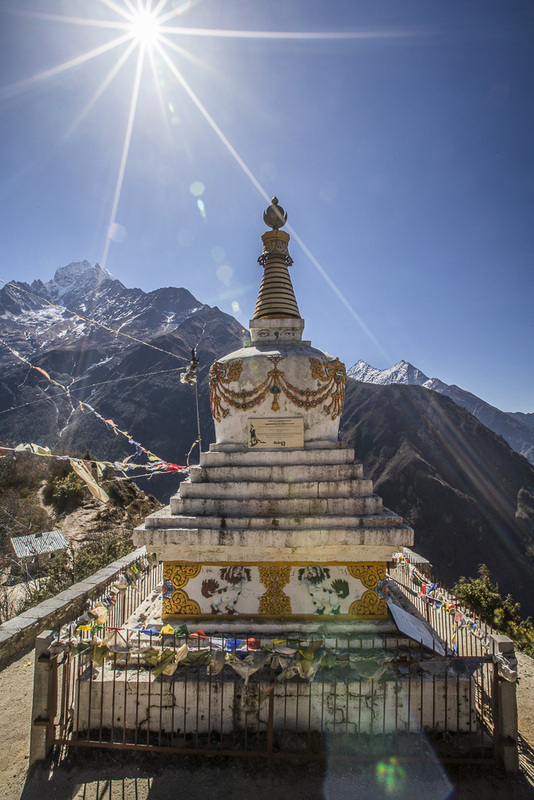 Prayer flags adorn most villages, all stupas and chortens and they are encouragement to the weary walker. 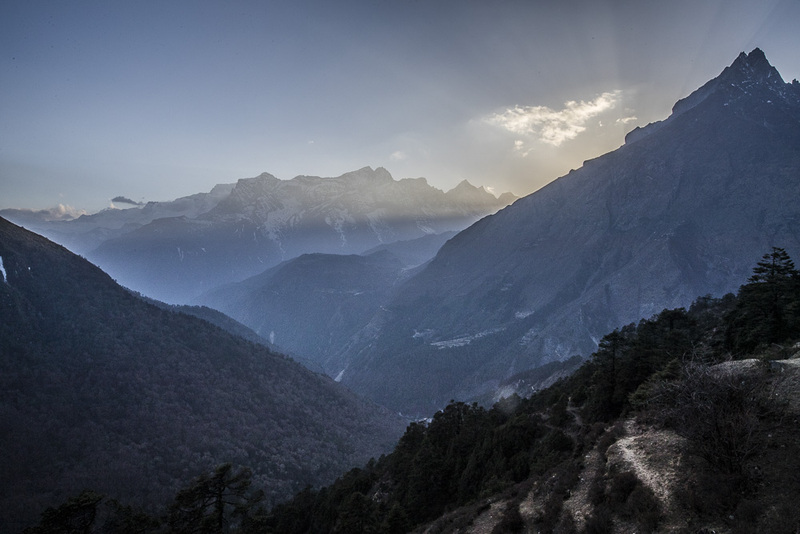 The way out of Namche rises a little before plunging steeply down towards the river and a small huddle of guesthouses. We stopped for a sherpa stew (basically all carbs in a veg rich stew- noodles, rice, pasta and potato floats contentedly alongside cabbage and carrot) as the next climb was tough. A steep continuous zig zagging climb from the riverbed to hundreds of metres higher in Tengboche. There was a slow trail from a group of Australians, all stopping for a photo, a drink, a snack, a chat, all the while creating a jam as the trail was so narrow with its sheer drop down to the river. We overtook as politely as possible, buoyed by the energy from the stew which clearly boosted us as we raced past the group and made it to Tengboche within the planned 5 hours with time to spare. 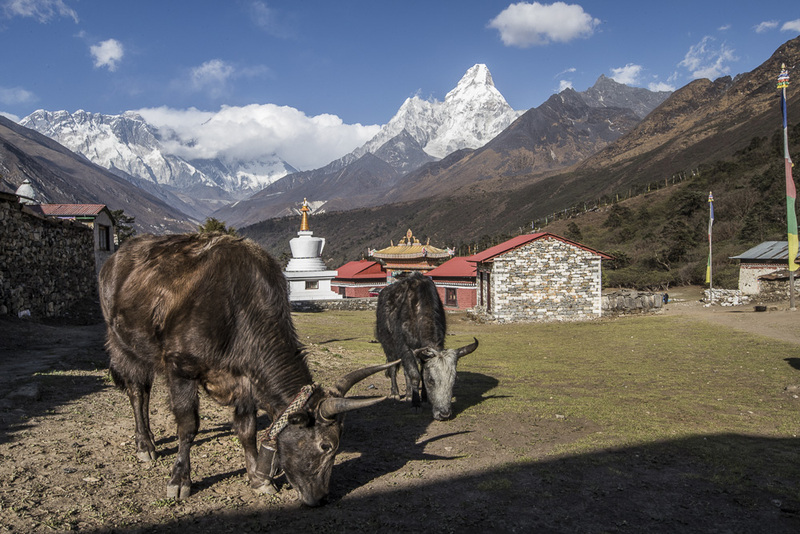 We were greeted by a flat expanse of grass next to a beautiful monastery, complete with yaks grazing, their bells clanging every time they bent their heads to eat. We had arrived in time to attend a puja at the monastery, we sat cross-legged next to the other trekkers and listened solemnly to the blessings recited by the monks. Some of the local yaks in Tengboche! It was so much colder at tengboche’s elevation (3860m) we both felt chilly even after the serious warm-up of the trek uphill. Sunset was hitting, making the temperature fall further. 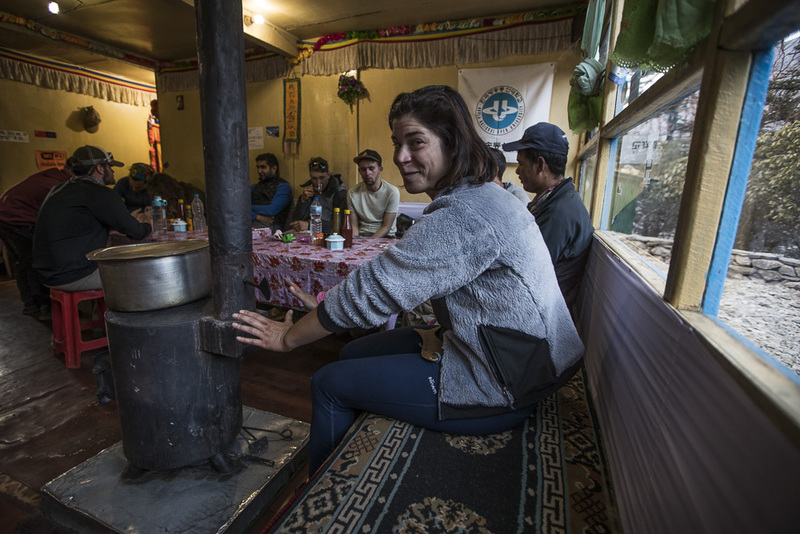 Alex was feeling the beginnings of a cold which had started to tickle the day before in Namche and was now digging itself in for the long haul. Walking outside of the guesthouse, we were treated to a beautiful view of the valley we’d just walked across and decided life was pretty good. 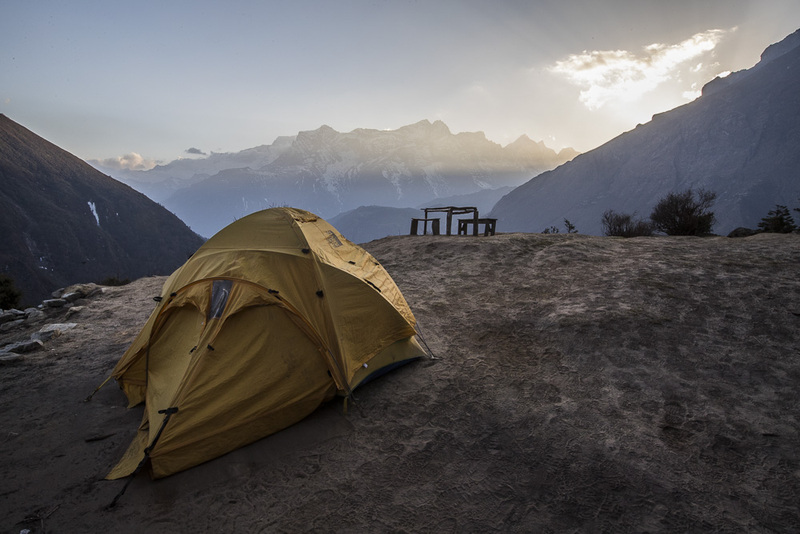 Accommodation is hard to come by in Tengboche and at times, one is forced to camp. This night was due to be -10degC so we hoped the occupants had cosy sleeping bags at least. 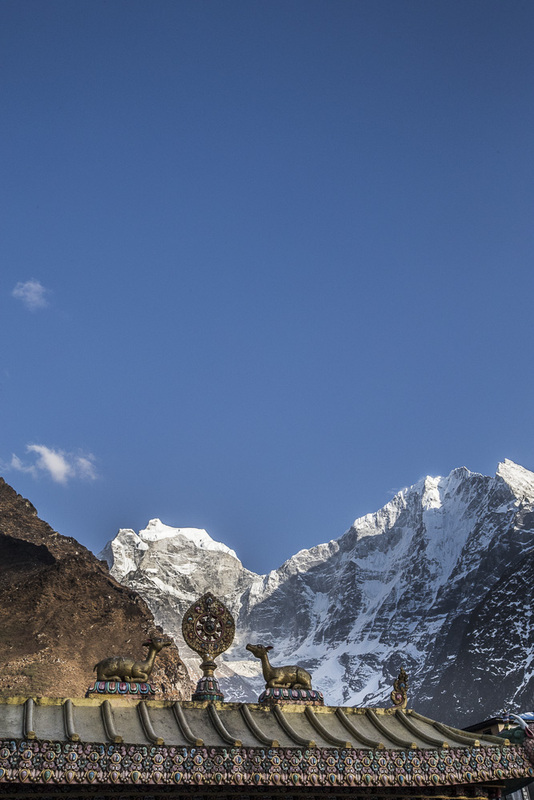 Tengboche marks the last point on the trek where guesthouses use wood to burn in the stoves. Every livingroom/dining room has a central stove which always has a pot or a kettle sitting on top to make the most of the fire. The stove heats up the room wonderfully and the wood smell is quite cosy. All the benches surrounding the room are carpeted as they serve as sleeping quarters, usually for guides and porters, once everyone has eaten and is ready for bed. There’s a lovely bakery in Tengboche- in fact, all along the route most villages seem to have a wonderful bakery which serves hot apple pie, doughnuts and cakes. All you can smell when you’re tired from the trek and too energised to eat is delicious fresh bread. The newly baked smell permeates the air and you remember your appetite as you sit down and sip a hot lemon tea and wait for an apple pie. In fact, at Kathmandu airport, you’re weighed on check in as well as your luggage. They have to freight in so much produce and equipment that the flights up to Lukla are always heavy-loaded. We’d despaired that the weight gain we’d both seen on the scales since starting the journey. Most people complain about losing weight when travelling the world, we are the first couple to gain weight!! Luckily, trekking with a packed load is good exercise, we were looking forward to the new, svelte versions of us to be unveiled on completion (apple pie notwithstanding)! 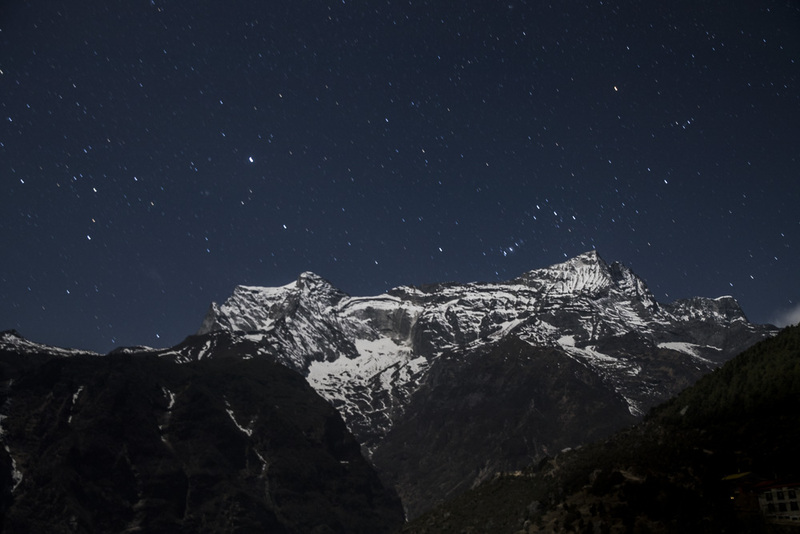 Our night in Tengboche allowed us to reflect on the trek for the next few days. 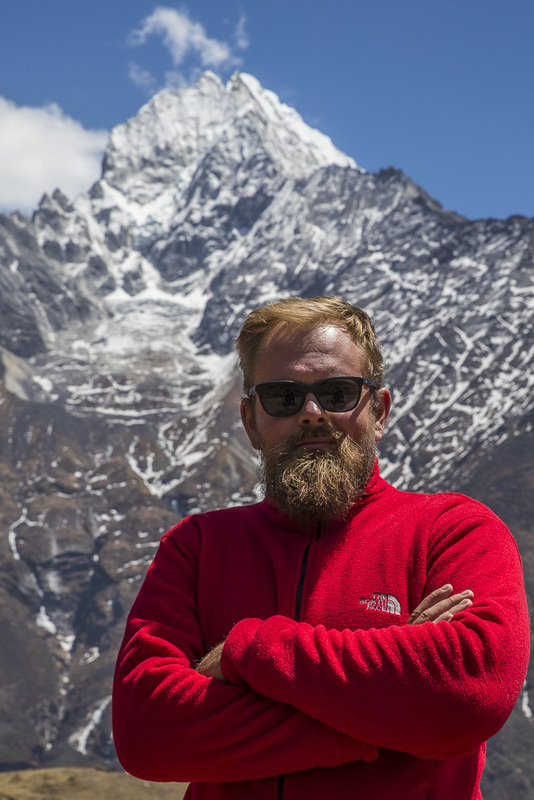 We were due to arrive in Dingboche the next day and have an acclimatisation walk to over 5000m. Both of us remembered our last time at 5000m in Peru. We’d unwittingly ridden from sea level in Arica, Chile to 5000m in a national park in Peru in a day and couldn’t figure out why we had nose bleeds and headaches. This time we were aware of the elevation and had increased it slowly so hopefully we would be lucky enough to continue to EBC. This was the first glimpse of what the trek would look like as only rock and ice lay ahead. 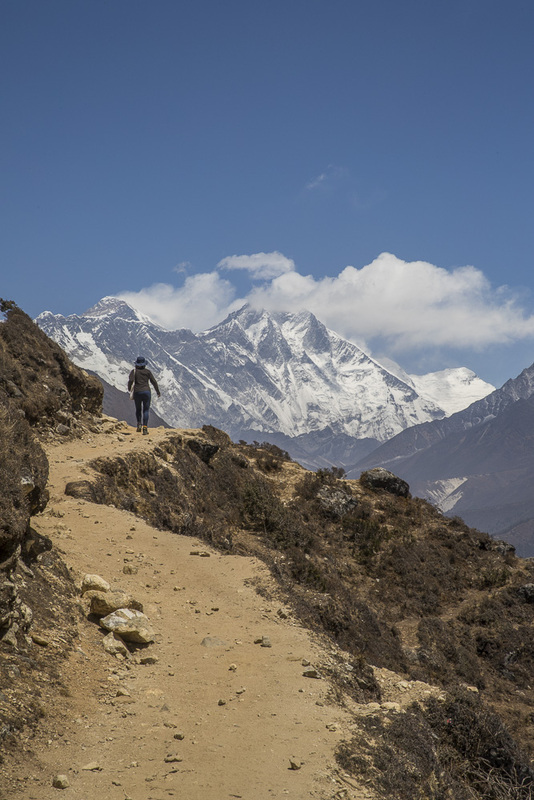 After a cosy night’s sleep and a breakfast of apple porridge and eggs, we set off on a far more desolate trail to Dengboche.